Are you tired of stuff just piling up, and you’re looking for How to Declutter Fast? 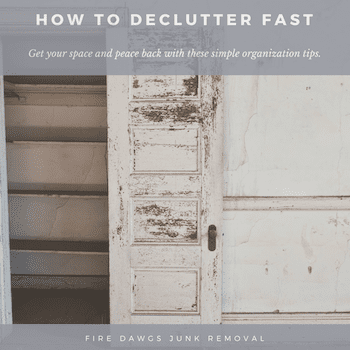 The junk removal and organization pros at Fire Dawgs are here to below. Follow these tips for How to Declutter Fast, and you’ll be on your way to an organized space in time! Set the Timer: Trying to declutter and clean up all at once can be overwhelming. So, set the timer for 5 or 10 minutes, and get to work! Choose one area that needs decluttered and focus in until the timer goes off. You may want to start small by choosing a junk drawer or a single cabinet that’s been accumulating junk. Do this at least once a day! Make a List: This tip and the previous one go hand in hand. Make a list of areas in your space that need reorganized. Also, make sure you start with the easiest areas first like drawers and cabinets. Next, you may add areas like closets to your list. Finally, add larger areas like rooms, basements, and garages. Don’t forget to check off items on your list as you complete them! Fill a Bag: Take one regular-sized household trash bag, and fill it. You can fill the bag with trash and junk. Or, you can fill it with items like clothing or toys that you want to donate. You can even set the timer while you fill the bag to get the task done fast! Take the Challenge: We did not originate this challenge, but it’s super effective! All you have to do is find 12 items to donate, 12 items to throw away, and 12 items that need to be put back where they go. You could even get really crazy with it and set the timer! More on the 12-12-12 challenge here and also here. Donate One Item a Day: Start at the beginning of the year, and donate one item a day. That’s 365 items that you don’t need, helping others! We hope our Tips for How to Declutter Fast have been helpful! We challenge you to take one day at a time, and you’ll have your space back in no time. You can do this!